There's a big difference between family fitness activities that work for babies and those that work for tweens and teens. As kids grow, their needs and abilities change, and so does your family schedule (a lot!). But one thing remains constant: When you share active play together, everyone benefits. When kids are very little, they often love to just go along for the ride. Strap your baby into a front carrier or backpack and go for a walk, or buckle her safely into a jogging stroller when you run. Let her watch you do yoga at home. Your goals now: Find ways to fit fitness into your new-parent life, and set the stage for active living with your baby. You're a role model from here on out! 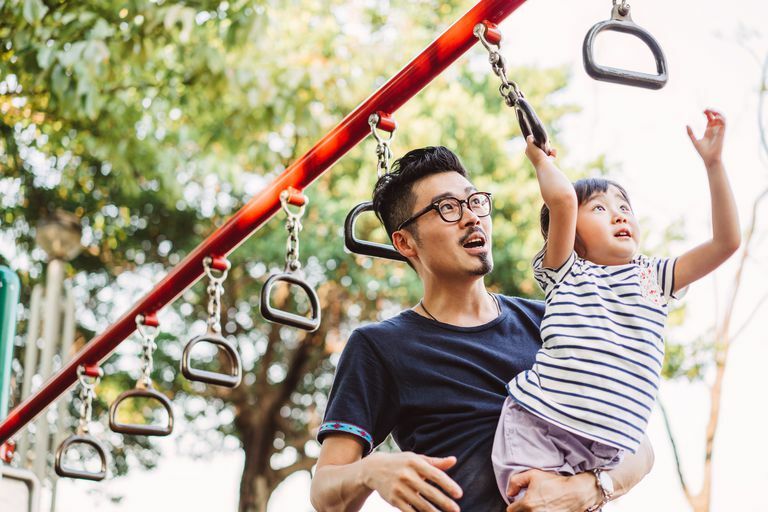 Once your child can walk, you can encourage physical play with simple activities like going for walks (without the stroller), visiting playgrounds that are friendly to toddlers, dancing and playing music at home, and using ride-on toys. If you and your toddler enjoy parent-and-tot movement or water safety classes, great, but they're not essential to your child's development, so don't worry if they're not your thing (or your kiddo's). Your goals now: Provide lots of opportunities for your toddler to move his body, and start introducing him to the fitness activities you like, such as hiking. As your child grows, you can share more active play together: swimming, art projects, exploring the outdoors. If your child attends preschool or daycare, be sure its policies promote physical activity. Your preschooler is learning lots of essential gross motor skills as he plays, and he needs your help to master them. Your example and your simple instructions ("use the side of your foot to kick the ball") will go a long way. At this age, your child is a little too young for organized sports, but she may watching others play (especially other kids) and trying little-kid versions of sports gear and toys. Your goals now: Make active play an important part of every day, and show your child that fitness is fun. When your child hits the elementary school years, you will have more opportunities to really share fitness activities. Your child may be interested in trying the sports you enjoy. If you're a runner, for example, you can encourage a love of running by cheering kids on during fun runs or signing up to do a 5K together. Kids also like discovering new things with you. You can learn something together (martial arts is great for mixed-age classes) or let your child teach you what he's learning in gym class or sports practice. Silly games—like the ones you played when you were a kid; think sledding, jump rope, and kickball—are almost always a hit with kids and are surprisingly fun for grown-ups too. Your goal now: Make physical activity a shared family priority. It's an ideal way to spend your time together. When your kids were babies, you took them along for the ride. Now it's the other way around, as your child's schedule often dictates what you do with your free family time. If your tween or teen is into sports, your role is to support her and help her do her best, and this includes role modeling healthy physical activity. If your adolescent doesn't enjoy organized sports, you can help her find another fitness activity that she does like. Better yet if it's something you can do together! Fitness offers many opportunities for shared family time during the teen years, when your child is capable of so much. You can go camping, hiking, running, or biking together; play catch, Frisbee, or table tennis; shoot hoops or play tennis; take yoga or dance classes. Your goal now: Set your tween or teen up for lifetime participation in sports and fitness. How? By making time for it, making it important, and making it fun!